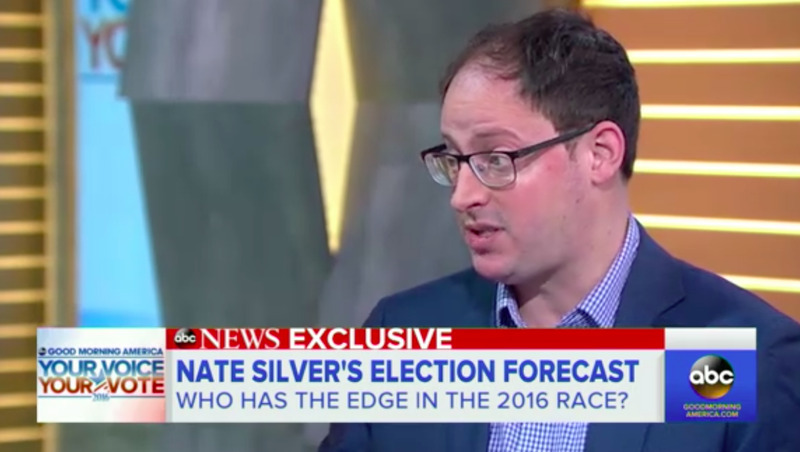 Renowned statistician Nate Silver revealed his general election forecast on ABC’s “Good Morning America” Wednesday, and he’s placing Hillary Clinton at a near 80% favourite to win in the fall. Silver, who runs the data-journalism website FiveThirtyEight, handicapped Clinton’s current odds at 79% while giving Donald Trump a 20% chance of winning the general election. Historically, the last candidate to blow a lead as large as the one Clinton currently holds was former Democratic Massachusetts Gov. Michael Dukakis in 1988. Dukakis, who left the Democratic convention that summer with a large lead over then-Vice President George H.W. Bush, would later lose by a wide margin in the fall. Silver called 49 out of 50 states correctly in the 2008 election and got all 50 states correct in the 2012 election. But, earlier this election cycle, he handicapped Trump as having a 2% chance of winning the GOP primary. He would later write a lengthy piece on how he got the Republican primary race wrong. FiveThirtyEight launches its general election forecast later Wednesday.